While BellHawk can perform all of its inventory and operations tracking functions using pre-printed rolls of license-plate tracking barcodes, it is sometimes required that the system quickly and efficiently print barcode labels for incoming materials, finished products and the packing materials used to ship these products to customers. It is essential that this labeling be performed without a lot of manual data entry, which takes time and can cause mistakes. In BellHawk, with the TAG option, when a user is entering materials into inventory using a PC or a mobile computer, they can request that labels can be printed out as part of the data entry transaction. The label is then printed out automatically on the designated barcode printer. This can be on a desktop printer or on a wireless printer attached to the belt of a mobile worker or located in cradle on his fork-lift truck. Alternately users can pre-print a set of labels, ready to attach to a set of items or containers. The information about these items, such as part numbers and lot numbers, is entered when the set of labels is requested, so that this information can be printed on the label in human readable format. These labels do not become active until the tracking barcode on them is scanned to record the items or containers into inventory. At this time the previously entered data is picked up from the database for each label and transferred to the item or container record in inventory. BellHawk's TAG module works in conjunction with BarTender Automation from Seagull Scientific, which provides printer drivers for a wide-range of barcode printers and RFID labelers. BellHawk also uses BarTender's label layout capabilities to allow its users to create labels in a wide variety of formats for a wide variety of media. BarTender Automation can only efficiently drive barcode printers connected to PCs, or connected directly to the LAN, in the manufacturing plant or other facility in which BarTender is used. As part of its TAG module, BellHawk Systems provides label printing software, which runs on a Windows Workstation in each local plant. This software enables BarTender to interact with the BellHawk software running at a remote data center over the Internet. The BellHawk TAG module uses Artificial Intelligence rules to prevent employees from making mistakes by choosing the wrong label to print or of entering the wrong data into that label. When a user requests a label to be printed, the TAG rules use information such as the Customer, Item, Container Type, and Quality Control status to automatically select the correct label and quantity of duplicate labels to be printed out. 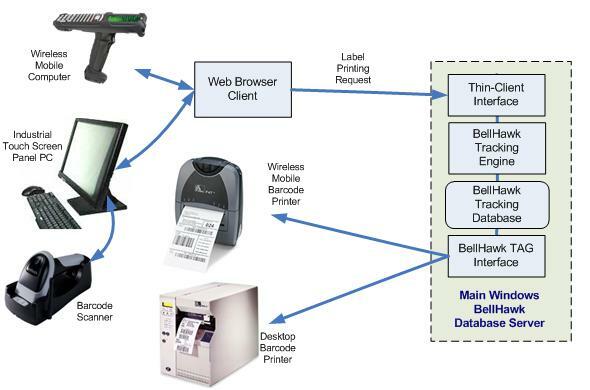 TAG then retrieves the needed data to be shown on the label from the BellHawk database, including user defined parameter data, and automatically prints the data on the appropriate printer, again selected by a set of rules, which depend on the device being used for data entry and the label format. This enables, for example, label printing to take place on a belt printer used by a mobile worker or on a nearby desktop printer, which is loaded with the appropriate media. For more details, please see PDF download "Preventing Barcode Label Printing Errors"